Posted on 16/11/2012 by Act For Freedom Now! 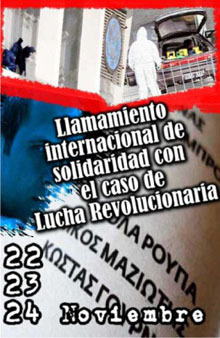 We undertake political responsibility for our participation in Revolutionary Struggle [Epanastatikos Agonas]. 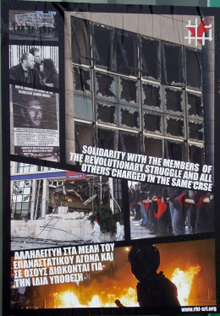 We declare that comrade Lambros Foundas, who died in Dafni on 10 March 2010 after a battle with the police, also participated in Revolutionary Struggle. 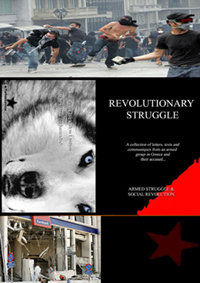 The battle was part of the subversive project decided on collectively by Revolutionary Struggle. It was a battle for revolution and freedom. We also declare that we are very proud of our Revolutionary Struggle organization. We are proud of our history and of each moment of our political activity. We are proud of our comrade, whom we honor and will always honor. And if the mechanisms of repression believe that imprisoning us will finish us off politically, they are wrong. Whether inside or outside prison, for us the struggle is and will continue to be a question of honor and dignity. And if the terrorists Papandreou and Chrysohoidis are laughing (in vain) about our arrests; if they believe they have thus guaranteed the necessary security for their social-fascist party to easily continue imposing their criminal projects on society, wagging their tails to please their American masters; if they are hoping they have eliminated a serious threat to their regime, we assure them that it will not be so easy to get rid of us. And if our persecutors and this country’s political establishment believe they have the whole of society by their side, if they believe most people consider us a “social threat,” they are wrong. The social threat to the majority of the population is the government who impose pack after pack of antisocial measures under guidance from the Capital’s crows who use their fluidity to “grease” the government machinery. Terrorism is the neoliberal policy imposed for years by the parties in power and supported or tolerated by the smaller parties. Terrorism is the application of the Stability Programme which has led great parts of the population to watch numb with fear an unprecedented attack against them going on up until now. Terrorism is the lack of basic means of survival, having your wage or pension taken away, your house confiscated by the bank, living among the pollution that kills. Terrorism is living daily with fear of survival. To most of society, the terrorists and criminals are those who govern: the regime’s politicians, the rich, and the privileged castes, which exploit the workers and prosper by simply participating in the economic and political establishment. The enemies of society are those who—after years of stealing, getting rich, and taking advantage of a barbaric and grossly unjust system—are asking us to donate our blood in order to save the life of the regime’s putrid corpse now that the system is going through the biggest crisis in its history. When the social-fascists in power claim to have the popular mandate to apply these policies, they provoke even more social indignation. In addition, they have already lost their legitimacy because no one has forgotten how PASOK extensively cheated broad strata of society during its election campaign. This is the same PASOK that took power by pure deception during the last election; lied about the so-called “redistribution policy” it supposedly wanted to apply, which was to benefit the poor; and lied when it promised salary and pension increases and a way out of the crisis, quickly and without undue aggravation. They lied about knowing the real condition of the state’s public policy, the lied about the economy’s condition and its potential, they lied about supposedly taking the money they need from the privileged. They stole power through lies, deceit and treachery. If they had revealed even the smallest part of their project before the election, they would now not only be out of the government but also out of parliament. The social consensus they are calling for is a monstrous lie provoking fierce social rage. 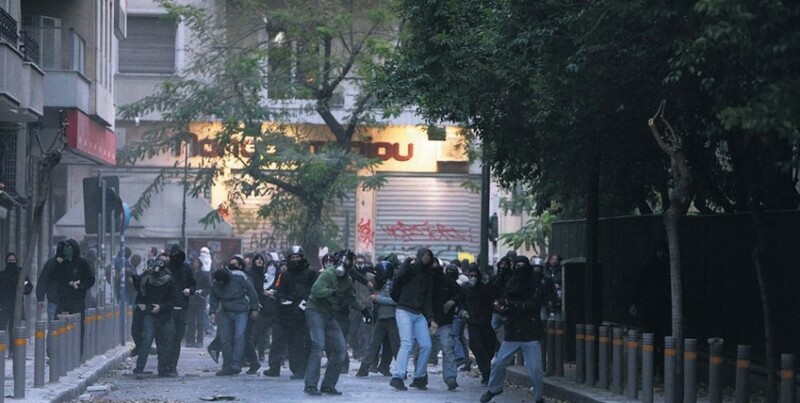 Right after the election, but still before PASOK revealed its true intentions, we as Revolutionary Struggle were already saying that the most brutal neoliberal offensive was on its way and would be launched in the name of “confronting the crisis and financial problems.” This has now been confirmed. Additionally, we talked about the Papandreou government’s imminent political failure, which we expect to see shortly, because this is very much about a perishable government quickly nearing its expiration date. Their criminal faces revealed, the keepers of political power nevertheless continue to deceive and trifle with us while insisting that what they are doing is “for everyone’s benefit.” Papandreou and his collaborators make us laugh when they call for patriotism, when they refer to the harsh measures they are imposing as “measures dictated by the national interest,” and when they talk about “saving the country.” And the culmination of this synchronized mockery comes when they say their efforts to ward off bankruptcy are for the benefit of the disadvantaged. It’s “a matter of national emergency” when they drive large portions of the population into poverty and misery in order to “stabilize the markets” (“markets” mean “savage beasts created by transnational economic elites”), stop speculation with Greek debt, and finally lower public sector interest rates. In fact, they have no interest in protecting either the country or the breakdown’s public sector. Most people are already worn out by the savage policies being applied to them, and their bankruptcy is a preliminary condition for the maintenance of privileged social strata. Pensions and salaries are being reduced or eliminated; hundreds of thousands of people are being laid off or will be laid off in the near future; tax audits are increasing; social security funds—after years of plundering, negligent policies by the State—are being allowed to disintegrate; and health services are being decimated while public hospitals fail and are left to deteriorate until they close, thus delivering the coup de grâce to any part of the public health system still left standing. This situation is not something temporary that will improve in two to three years, like the powerful proclaim in order to reassure society, but something that will progressively worsen given the continuing efforts by the political elite to “get the country out of the crisis”—in other words, to save the economic and political ruling class. After all the monstrous lies told by the government, we heard a number of quite earnest statements (for example, from Economic Minister Katseli) to the effect that “the crisis in Greece provides a great opportunity to apply the changes needed for global economic restructuring.” Of course, that means “the only opportunity to pass all the neoliberal reforms,” which previous governments didn’t even think of proposing due to the feared political cost of the social responses to such reforms. They are talking about their only opportunity to quickly do away with every achievement and social gain once and for all, privatize benefits and the health sector, drastically reduce the cost of labor, and transform Greece into an exploitation paradise for Capital, with a large quantity of cheap labor devoid of all rights. They are talking about their only opportunity to bring about the cruelest redistribution of wealth from the bottom to the top. They are not interested in saving the disadvantaged, whom these policies condemn to a slow economic and social death. They want to save Greek capitalists, banks, big business, and arms manufacturers. They want to protect investors and every greedy opportunist who gambles with Greek debt and has thus far turned a profit. They want to protect themselves and the rest of the country’s political elite from the fall of the regime, which will also mean the dismantling of the state machinery. They want to protect themselves and the privileged people who relish taking part in the system. The disadvantaged, who are simply disposable material to be used for the survival of the powerful, are now guaranteed the most profound economic and social collapse the country has seen since German occupation. PASOK is handing over land and sea to big capital; it is selling the entire country in order to save the hides of the local political and economic elite. If only the lies would stop. Who are they hoping to fool when they say the financial collapse will mainly affect the poor, when they try to convince us that it’s in our own interest to “help overcome the crisis”? Anyway, by the time the country “has been saved,” all of us will already be dead. There will be no work, poverty will infect everyone like the plague, people will get sick and die without being able to do a thing about it, and the standard of living will be like that of a country at war. Because we are now at war. This has nothing to do with the war referred to by the lying Papandreou. The government didn’t declare any war on the markets and the speculators, like they say. The ridiculous statements we’ve been hearing all this time, especially from the mouth of the aforementioned actor who now manages the country’s destruction, only serve to confuse society. We are facing a social and class war of an unprecedented level of intensity. We have the privileged social classes synchronizing and coordinating their forces in order to unleash the greatest class attack this country has ever seen. This is a war that the capitalists, with help from the government, have declared against the workers. This is a war of the powerful against those who struggle. We are facing a unique social situation in which the social and economic links between the privileged and the disadvantaged are breaking, one after another. An enormous social rupture is looming, along with an unprecedented political antithesis between the elite and the social base, and that has explosive potential. 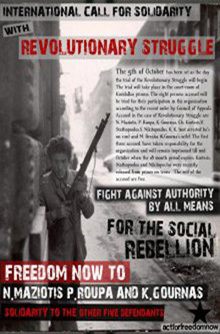 In this situation of a never-before-seen terrorist attack launched by capital and the state, and while the overwhelming majority of people are experiencing a previously unimaginable state of fear and insecurity, it would be truly ridiculous to assert—like the authorities do—that our arrests have something to do with “confronting a social threat” and that the objective of Revolutionary Struggle was to “seriously frighten the population,” as the charges state. We are certain that most do not perceive the lengthy, consistent political presence of Revolutionary Struggle as a “threat to society,” but rather as a political presence always with the oppressed and against the political and economic elite, on the side of those who live under the yoke of Power and against those who exercise it. Despite the ideological counteroffensive unleashed against us by the government and mass media, most of the population understands that the war against us is a war against those who want to forcefully resist; it is an instrument of intimidation and terror to be used against those who are thinking about rising up in defiance of the criminal policies of power. Anyone who looked closely at the trajectory of Revolutionary Struggle would understand the obsolescence of the assertions by the political establishment and its henchmen in the media about how our actions “constitute a threat to all of society.” Which of our actions terrorized society or were directed against it? Was it the attacks against the Economic and Labor Ministries, which are hated by the majority, and where the most antisocial policies are approved and decreed? Was it the attacks against riot police, who terrorize the streets every day, who beat demonstrators, and whose sole mission is the violent repression of social struggles? Does it have something to do with our attacks against police stations, which give shelter to the regime’s trained killers, and where those who fall into the hands of the pigs are tortured, beaten, and murdered on a daily basis? Did the attack against Voulgarakis—who was personally implicated in two huge scandals (wiretapping and the abduction of Pakistanis), and who used his ministerial seat to increase his family fortune through public land deals (the Vatopedi case) terrorize society? Most people who live in this country would very much like to see him, as well as all those mixed up in similar cases of insatiable theft of government property, hung in Syntagma Square. Was the attack against the U.S. Embassy an act of terrorism against society? Don’t our persecutors and their superiors know that this attack was contentedly received by a large portion of Greek society, which is not especially friendly toward the United States? Did the attack against the multinational Shell—which for decades has plundered the natural resources of many countries, exploited entire peoples, and contributed to the destruction of the planet—terrorize the population? Or was it the attack against Citibank, one of the main gangs of international financial terrorists, which for decades has played an important role in the process of capital accumulation by stealing the wealth of innumerable countries via speculation with their national debts, thus bringing them to often irreversible economic and social ruin? Was attacking this multinational economic criminal, which is the ringleader of those who created the crisis we are now going through, an antisocial act? Or was the attack against the Stock Exchange (that Temple of money, and one of the main channels for the plundering of social wealth and its transfer from the social base to the economic elite) an act of terrorism against society? The only ones who were terrorized by these political actions were the political and economic authorities. The criminals are the capitalists, who are concerned about their “investments” and simply afraid of not being able to effortlessly cross the borders of their own modern dictatorship. If these attacks constitute a threat to anyone, it’s only to those who are enjoying the economic and social power derived from the current regime and from social slavery. Therefore, our imprisonment is not a solution to the problem of public safety, but exactly the reverse: It is the attempted answer to a political threat to the regime, which allows capital and the state to most reliably exercise mass terror against the most people. Our persecutors’ objective is to eliminate an element capable of waking up society politically. Their objective is to erase a revolutionary threat. For much of the international political and economic elite (including the IMF vultures as well), the global economic crisis is already over, and the economic recovery has now haltingly taken its place. Prospects look good, while the crisis in Greece is nothing more than the result of poor management by previous governments. The economic and political system’s defenders and apologists only identified “the crisis” with the shake-up in the international financial system, and since that seems rescued thanks to generous cash loans offered by the governments, they are now talking about an end to the system’s problems and the beginning of a perhaps grueling and none-too-short economic recovery process, but only on the condition that governments apply the necessary austerity measures. The regime’s analysts also view the Greek crisis with the same superficial focus, which divides it into several separate (and for many, also independent) dimensions. To them, the economic crisis is simply a consequence of poor management of the system, which with some specific adjustments will return to its previous harmonious functioning. To those who take part in the system’s leadership, the financial crisis in Greece is nothing but a secondary effect of the global economic crisis. It’s a problem that stems from poor management of public funds by previous governments. Of course, we won’t question the fact that all those different governments systematically and without exception plundered public funds. With wealth siphoned from the social base by the state, every administrator’s gang —bar none— was getting rich and living off of squandered public funds. Every now and then, they would perhaps throw out a few crusts of bread for the remainder of the population in an attempt to gain votes. The big party thieves amassed enormous fortunes, built mansions, bought yachts, and secured a life of luxury for themselves while the majority is living in a state of economic terror imposed by the state and capital. However, when the IMF and European Union vultures accuse previous governments of wasting public money, they aren’t referring to what we’ve mentioned, nor are they referring to the billions of euros those governments gave away to capitalists of every nationality operating in Greece. Instead, they are accusing previous governments of wasting public money on salaries and pensions, squandering it on public health and the education sector, and being too reluctant to tax the social base. The Greek state has been bankrupt for a long time, whether the government admits it or not. The support mechanism constituted by the IMF, the European Commission, and the European Central Bank has already taken the reins of power, and its mission is to lend Greece cash in order to pay off those who took loans out of Greek public funds in the form of bonds. The trade-off for this “economic salvation” will be the cruelest pillaging of society by transnational capital. Greece’s financial problems (apart from the plundering of public funds for personal benefit by those in charge) stem from the dominant model of development adopted during the past few years, as well as the link represented by Greece in the chain of the global production process. Greece’s role in Europe has always been that of a market for European products. And while the expensive euro was preventing European products from competing with the much cheaper products manufactured outside the European Union, the small Greek market was obligated to consume as many products from “eurozone” countries as it possibly could. The assertion that “Europe is offering economic security to Greece” is nothing but a monstrous lie. From the beginning, the imperative of Europe’s economic strategy for Greece was to dismantle the previous production model and force the Greek state to stimulate consumption via loans. Greek governments continued to offer loans to finance the investments of EU companies in the Greek market, and simultaneously helped out Greek capitalists. Moreover, after incessant propaganda from the banking groups, Greek society entered the loan labyrinth, which is exactly where a large portion now finds itself trapped. Even in the midst of the crisis, with public as well as private Greek debt having already reached the amount of 1 trillion euros, President Trichet of the European Central Bank enthusiastically declared that “the Greeks still have a margin for new loans.” In other words: Keep consuming in order to support crisis-weakened European growth and the continuing profitability of the banks and corporations. Illusory prosperity and high growth rates never correspond to the true economic situation; rather, they reflect the huge profits of capital. Plus, we had already pointed this out in 2005, at a time when everyone was still talking about the “strong Greek economy.” Even then we had predicted big economic problems and a real risk of insolvency, which Greece will face in the event a crisis of global dimensions explodes. To all kinds of speculators/managers and owners of big capital the crisis leaves no margin for the high profitability of the traditional sectors of the economy. Even many Stock Exchanges aren’t offering sufficient returns to satisfy the greedy capitalists, nor are the raw materials and foodstuff markets (despite the fact that prices are too high given the global decrease in demand) offering—at least for the moment—the possibility of an increase similar to that of 2008. And all this is going on despite investors doing everything possible to expand the bubble now present on certain Stock Exchanges. On the other hand, national debts represent the best opportunity for transnational capital to extract —in the midst of crisis— enormous profits. The international debt bubble in the main capitalist countries is now very large, but speculators of all kinds don’t want it to stop. They want just the opposite: to continue exploiting it until the end. The derailment of public debt in the central countries is a function of the enormous financial aid packages dispensed by their governments in order to save the global financial system. In short, for most people in the central countries, the financial crisis has been overcome, at least for now. The governments of these countries are going to systematically default, depositing public wealth into the black-hole accounts of the same big financial groups that created the crisis. The gigantic dimensions of the financial sector (in 2006, before the crisis, the world GDP reached $47 trillion, the total value of all shares of stock exceeded $50 trillion, the value of all bonds was around $70 trillion, while the value of all derivatives exceeded $470 trillion—in other words, an amount ten times greater than the world GDP) is quite disproportionate to the number of people involved in it as well the size of the economies of the most developed capitalist countries. The efforts of governments to carry the debts of these banking and investment monstrosities on their shoulders is going to bankrupt many of these economies, even those that have been strong until now. The entire planet’s economic elite contributes to all this while continuing to gamble with international debts. A large portion of the cash frozen by the crisis was viewed as a profitable way out of public debt, thus nourishing the bubble, which was highly destructive to the population and whose cracks that same population will be forced to pay for. The game of great speculative attacks against national debts began with Greece, which due to its poor public finances and enormous debt appeared to be “the perfect client” for the markets. High interest rates, which according to “investors” reflect economic insecurity and an increase in potential indebtedness, yielded huge profits for everyone who “gambled” with Greek debt, until now. In case after case, increased market volatility always corresponds to higher profitability. All the world’s economic elite took part in the creation of the debt bubble, once again believing they could siphon enormous profits from public debts. After all, according to the statements of their spokespeople, “countries will not be allowed to fall into bankruptcy.” This is the same notion that emerged during the previous debt crisis involving the peripheral countries in the ’80s. As much then as now, the big capitalists were of the opinion that “sovereign nations do not go bankrupt.” Along those lines of thought, Greece managed to get into debt with interest rates that exceeded 9% (and sometimes reached 15%), and the government fell into the arms of the IMF, European Commission, and European Central Bank “rescue mission,” which will now officially save the Greek state from economic ruin. The capitalists’ statement that “sovereign nations do not go bankrupt” indirectly expresses the pressure those same capitalists are applying in order to take control of the international mechanisms “saving” the indebted countries. That way, they won’t risk the capital they’ve invested in debt, and they can peacefully continue to profit. Still, the greed of transnational capitalists is growing so quickly that even “rescue” mechanisms like the IMF can’t cope with it. In Greece, there is lots of insulting talk about “speculators,” but it’s never specified who they are. It certainly isn’t just a question of the white-collar youth employed by the transnational investment firms, “seated in front of their computers while they gamble with the country’s debt,” like Papandreou said recently. It’s about the entire economic elite. A large portion of Greek debt is in the hands of Greek banks, and through them the “cream” of the Greek plutocracy and all respectable businessmen command the respect of the country’s political elite. And let’s not forget the scandalous process by which Greek banks are raising money at almost zero interest from the European Central Bank, offering as collateral public sector bonds they obtained for free via the 28-billion-euro aid package (approved by the previous government). They then offer loans to the state at the market’s highest interest rate. And all this is taking place after they’ve already put away billions in cash in their vaults, thus ensuring their own liquidity while the government —which under the current circumstances is selling off the country for loans— is calling on them to make use of the “unofficial” remainder of the aid package. The famous “gun,” usually invoked by the ridiculous Papandreou whenever he receives some verbal support from his “fellow” higher-ups in Europe, isn’t pointing at any speculator. The weapon does exist, but it is pointing at most of this country’s population, making them submit to the threats of the government and the saviors of the Greek political system. Papandreou, like a modern Tsolakoglou, has now ushered the country into a new era of occupation—this time by transnational capital, with the IMF, European Commission, and European Central Bank supervising the austerity and reform programs under the slogan of “saving the country,” all in order to finance regular payments to the Greek State’s creditors. All the promises about the “credible role of the IMF” and other attempts to positively portray events—made as much by the government as by the IMF lackeys themselves—aren’t worth much. We know that every country the IMF touches suffers devastating consequences. In Africa, Asia, and South America, the IMF has been responsible for the destruction of economies, systems, and production models that weren’t profitable to the vultures of transnational capital it serves. In many cases, these “beneficial” interventions resulted in famine, disease, civil war, social catastrophe, and irreparable damage to the environment. It also sounds like a bad joke when, after decades of IMF activity always yielding the same disastrous results, many —primarily leftists and social-democrats— continue to describe the IMF’s brutal neoliberal formulas as merely “strategic errors.” They can’t possibly believe it’s simply a question of a few incompetents. They know exactly what they’re doing, and their interests are very specific. Debt that a country is incapable of paying represents an opportunity for the economic elite, through the IMF, to bring that country to its knees, annihilate it, and conquer it. After bleeding it dry, they lead it into bankruptcy. Then come the vultures of Capital, who—for breadcrumbs—buy up everything valuable in order to later exploit it until said country becomes a paradise for capitalist exploitation, where inhuman working conditions finally prevail. This is the IMF plan for Greece: a plan that quickly leads to the hyper-accumulation of economic and social power in even fewer hands, and drives the people into misery. If we allow the regime’s criminals to continue these policies, it means that we are surrendering to the most disgraceful slavery of all, feeding the country and our children’s future to the shark’s teeth of big capital, and accepting a life of constant terror from the international economic and political oligarchy. No free person can accept such treatment. No dignified person can give up without resisting. While the system itself is burning the bridges that connect it to the social majority and taking an openly hostile position against that majority, it would be a serious mistake to try to rebuild those connections from below. In one way or another, the leftist parties that participate in the political system will attempt to weaken social conflict and do everything possible to avoid the imminent social explosions. And even though they may gnash their teeth over the government’s decisions, in no way will they break with the system. On the other side, the disadvantaged await a new political force, independent of any political motive or desire to manipulate; a force capable of creating the political ground on which they can plant their feet and fight the brutal conditions imposed on them by modern life. This new political force can’t be anything other than a broad radical movement—without inhibitions or reluctance, without a guilt complex or illusions about whether or not total confrontation with the regime is necessary—capable of outlining a project for the destruction of the system and inspiring as many of the oppressed as possible toward a liberatory direction. Today, when we find ourselves living under the pure, harsh Dictatorship of the markets, anyone who still keeps shouting that “the objective conditions are premature” is someone who isn’t willing to practice subversion. The objective conditions are more than ideal. Let’s also create the subjective conditions needed to bring about the revolution. This is our chance. 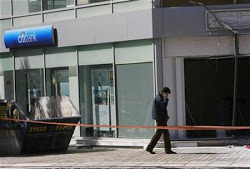 This entry was posted in General and tagged all in Athens, and responsible for the following attacks, Kostas Gournas 29 April 2010, NIKOS MAZIOTIS, Political letter to society by Pola Roupa. Bookmark the permalink.